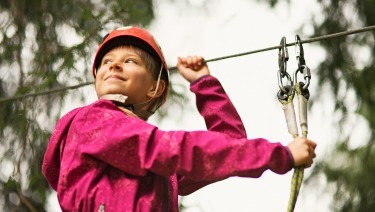 ​​​Before you harness your child into a zip line at camp or during a family vacation, you might want to ask the operator a few questions about the ride's safety. A common attraction at camps, amusement parks and in backyards, zip lines are popular across the U.S. But not every company follows the same safety rules. Nearly 17,000 zip line injuries were treated in emergency rooms from 1997-2012, and most of those injuries were in the last four years, according to a 2015 study by Gary A. Smith, M.D., Dr.P.H., FAAP, and colleagues at Nationwide Children's Hospital. About half the injuries involved children under 10 years old. Another 33% involved children ages 10-19 years. The study noted that many zip lines are not regulated, and there are no uniform safety standards. The increase in the number of zip line injuries in children is "an epidemic by any definition," according to Dr. Smith, past chair of the American Academy of Pediatrics (AAP) Council on Injury, Violence and Poison Prevention. "If kids are using them, you really need to make sure they're using them in places where people are trained, they know what they're doing and the zip lines have been constructed in a way that they're not going to fail," said Dr. Smith. Backyard zip line kits sold online and in stores also have been linked to injuries. Earlier this year, the Consumer Product Safety Commission recalled a backyard zip line kit because of a design flaw that made it easy for the cable to separate from the line, causing riders to fall. Riders suffered head injuries and bruises. Another recall was issued in 2014 for backyard zip line trolleys that released unexpectedly. No injuries were reported. Authors of the 2015 study warned against buying and installing backyard zip lines. "If done correctly, these and other types of outdoor amusements that are there for the thrill … can be done in a safe enough way that it's reasonable for children to use them," Dr. Smith said.